I’ve been attending HDC for about 4 years and I’m happy to say I am presenting this year! Register now and come see my talk titled From Idea to Core Feature Set where I’ll show you how to take an idea for a product or an initiative at work and get to a shared vision of what is really most important and what really needs to get done first. We had a small problem on our team since we upgraded to Windows 8.1 from Windows 7 last week – only Internet Explorer was working 100% with our proxy server. Other browsers, such as Chrome, would let us get out to most sites, but some sites that were on our active directory group’s allowed list (like github.com) were not working. The problem kept aggravating us as we found more and more sites and services were broken, but none of which were serious enough to enter a service ticket that would get our network team involved; one of which did look at it briefly and found it worked fine on his machine. I love how the solution came forward through team effort on the part of Grax and Costenbader and myself: each of us chipped in a few minutes of toying with it throughout the day and did a great job of reporting what we’d found to each other. We even put a bounty of a burger at Honest Abe’s on the line, although in the end we all earned it. Our proxy server requires authentication and has a PAC file for configuration. Again, these were working great in IE, but not in anything else. I realized we were getting a 407 Proxy Authentication Required error by using LINQPad’s check for update’s tool (chalk another win up for that great tool!). Grax took the information from the PAC file and was able to manually authenticate using LINQPad’s update tool and got that working. BAM! That was a great break through. Costenbader then went into Window’s Network Proxy Settings (type that from the start screen to get there) and set Auto Detect Settings to On, but turned off the Auto Configuration Script that was trying to load that PAC file. He then turned on the proxy server and used the information from the PAC file to enter the server and port, and checked the box to not use the proxy for local services. BAM! That fixed 98% of our problems. I put the finishing touch on when I entered a few of the “except for” addresses into the proxy settings that I grabbed from the PAC file. DONE! We now have access to all the sites we had access to in Windows 7. So, in summary, the PAC file combined with an authenticated proxy made it appear that Chrome wasn’t working, as well as some other services and tools (we didn’t try FireFox). Chrome uses the computer’s proxy settings though, so by fixing our network proxy settings we fixed Chrome and all the other tools we were trying to use. 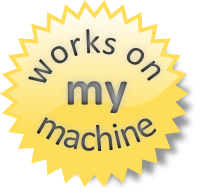 We aren’t bypassing any restrictions, we’re just changing the way it is configured so that it works on our machines, too! We found a great way to pass an afternoon by combining a little vinegar and baking soda to make rockets. You can also make grenades by shaking and throwing the container after snapping the lid on. Cooking is one of my favorite hobbies. I love tweaking recipes to try new flavors and learning about different combinations that go well together. It’s one reason I love Cook’s Illustrated because they teach you by telling you all the things they tried while perfecting their recipe. There’s a burger at Honest Abe’s that a friend of mine orders every time (the 1809 burger). I told him that my summer project is to develop a burger that he would order instead of that burger – one that surpasses its savory excellence. I’ve taken the first step towards that goal by creating a repository to version my recipe until it is perfected, and a video to teach you how to make a gourmet burger in your backyard. Enjoy! It’s been almost 6 years since I visited Paul’s museum in Belleville, KS. I can’t wait to take my son there to see the amazing animated carvings Paul created!